Anna Bogan, secretary to Mrs. Elmhirst, has written Miss Berry a letter to inform her that Mrs. Elmhirst is still abroad and Miss Bogan herself will soon be joining her in England. She expresses her sympathy regarding the dormitory fire and explains that Mrs. Elmhirst will not be able to contribute at this time but perhaps will later in the year. 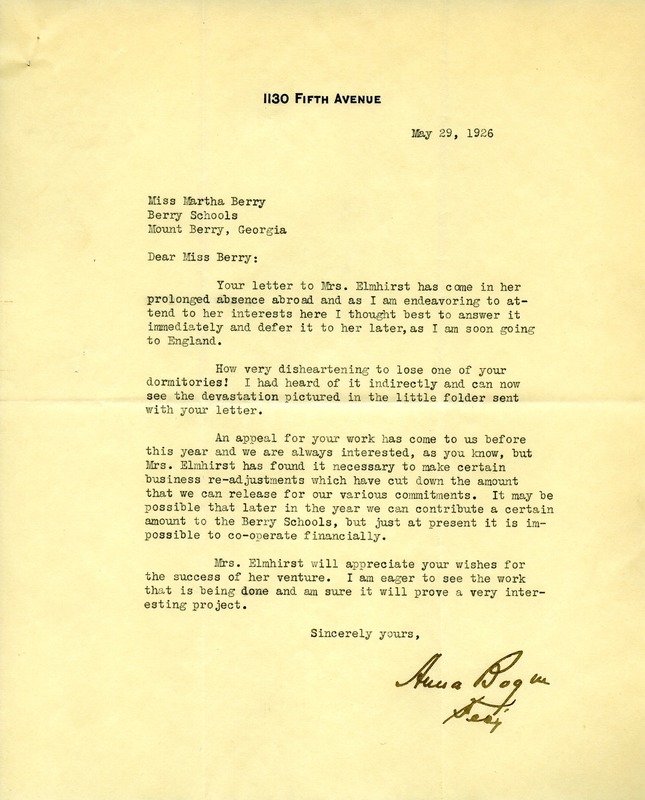 Anna Bogan, “Letter to Martha Berry from Anna Bogan.” Martha Berry Digital Archive. Eds. Schlitz, Stephanie A., Chelsea Risley, et al. Mount Berry: Berry College, 2012. accessed April 25, 2019, https://mbda.berry.edu/items/show/1970.